In the entire state of California, you will find only one location where you can drive onto the beach — and camp on it. That place is Oceano Dunes south of Pismo Beach in the town of Oceano. Beach camping is an appealing idea and a potential bucket list activity. Before you hook up the RV or take off with a tent to do that, these are the pluses and minuses to consider before you decide whether or not it's for you. At Oceano Dunes, there are no trees (and therefore no shade) — but there's plenty of sand. Maybe too much sand. The best part of staying there is that you'll wake up with the ocean at your doorstep. The downside is that your doorstep may have been buried under blowing sand during the night. Experienced campers will tell you that it's futile to try keeping sand out of a tent pitched on the beach. Even if you take an RV, you'll be finding grit in the weirdest places for weeks after your trip. What Facilities Are There at Oceano Dunes? At Oceano Dunes, they have vault and chemical toilets (porta-potties) but no other amenities. If you don't have a self-contained RV, it's indeed a primitive situation. Water delivery and holding tank pump-out services are available on the beach. An RV dump station is on LeSage Drive near the park entrance. The most popular activity at Oceano Dunes is riding off-highway vehicles and ATVs on the dunes, but you can also enjoy any kind of beach recreation. You can also use this guide to things to do in Pismo Beach to find out what to do when you're ready to go somewhere else. Don't get confused and make a reservation at the wrong place. The names are similar, but Oceano Dunes is not the same as the Oceano Campground at Pismo State Beach. Driving on the sand at Oceano Dunes is recommended for 4-wheel drive vehicles only. 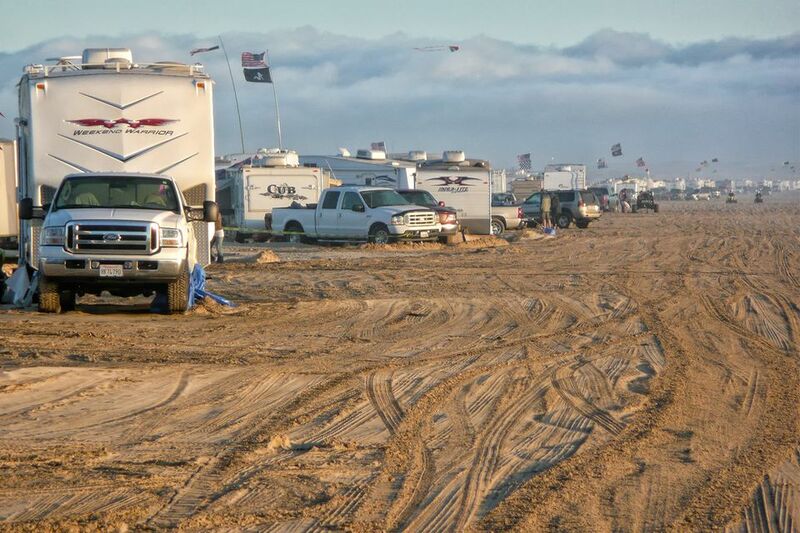 You can have an RV delivered and set up on your campsite at Oceano Dunes. Luv 2 Camp is the only company authorized to do that. Camping on the beach is allowed south of Post 2 on the beach and in the open dune area. There are no defined spaces. The vehicle length limit is 40 feet. Tents are also allowed. Even though the sites aren't assigned, you need reservations year-round at Oceano Dunes. You can make them online or by calling, but you need to do that up to seven months before you want to go and have quick dialing reflexes. Here's how to make reservations at a California State Park. If you don't have a reservation, try getting there at 7:00 a.m. to secure an open camping space. That might work in the middle of a week off-season, but during busy times of the year, you need a contingency plan. That's where the guide to camping at Pismo Beach comes in handy. Dogs are allowed at Oceano Dunes, but you need to bring (and use) their leash and keep them under control. A small rug or mat both outside and inside the door of your tent or RV can minimize the amount of sand that makes it all the way in. Regular Oceano Dunes visitors say you should bring earplugs to block out the noise of vehicles coming and going in the early morning. If you're camping at Oceano, use south entrance on Pier Avenue. Use 200 Pier Avenue in Oceano as your GPS destination. Get more details at the Ocean Dunes State Park website.